Saint Vincent and the Grenadines is a place of pilgrimage for people who are fans of Pirates of the Caribbean. As it may seem, the movies were filmed in the Caribbean since Saint Vincent, and the Grenadines is a Caribbean location. Plus, you get to see how bananas are grown and collected for import since the island is a major banana producer. You may get sick of them by the time your trip ends, but it is the experience that counts. Saint Vincent and the Grenadines consists of two major regions. The island of Saint Vincent and an archipelago called the Grenadines, hence the name. However, that is of little importance since the location as a whole is a small tropical paradise where you can bathe in the ocean all year round. However, before you go, there are a few things you should know. One of the first things that you need to cover is the visa. That is if you need one, and the chances of a visa exemption are very high for you. Why? Because most nationalities can enter in Saint Vincent and the Grenadines and stay there without a visa for a period that varies from 90 days to 6 months. It depends on the nationality, which is why you should check the visa policy of Saint Vincent and the Grenadines and see for how long you can stay there without a visa. Unfortunately, the visa policy of Saint Vincent and the Grenadines also contains a list of 8 countries whose citizens are not exempt from getting a visa. As a result, the citizens of China, Dominican Republic, Iran, Iraq, Jordan, Lebanon, Nigeria, and Syria need to apply for a visa prior to leaving. The visa application form must be submitted at the nearest diplomatic mission of Saint Vincent and the Grenadines. The application process is reasonably simple, and the fee for the document is EC$200. 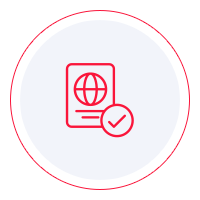 Other than the visa requirements, you need to know a few other things as well. For one thing, the climate in Saint Vincent and the Grenadines is tropical, and the temperature slightly changes when the seasons shift. However, there is nothing out of the ordinary, and the water in the Ocean is warm enough for a soak every month of the year. The islands are small tropical paradises where most people go and lay on the beach all day long. The official language in Saint Vincent and the Grenadines is English. You should get around just fine around the islands. However, as a former British occupied territory, the accent you will encounter is more British than American. Even so, you should communicate and understand what the locals are saying just fine. Most of the people who travel to Saint Vincent and the Grenadines choose to stay within the resorts and relax. While that is not the worst thing, it would be a better experience for you to get out of the resort and explore the culture. You can follow the Vermont Nature trail for some amazing scenery, you can swim in the Tobago Cays, or if you are up for it, you can climb La Soufriere Volcano. The latter is not an easy activity, but if you have moderate to good physical fitness, you should get some proper equipment and make an attempt. The view from the top is spectacular. You will see that it is worth the climb. Food and drink in Saint Vincent and the Grenadines is more than satisfactory. The resorts have fantastic restaurants, and if you have the stomach, you can try the black wine. However, you should be very careful about the tap water. It is safe to drink most of the times, but not from everywhere. Also, during the rainy season, it is best if you avoid it altogether. Bottled water is widely available, so you should take the safe way and consume only that. Saint Vincent and the Grenadines is a gorgeous location, with long beaches and excellent views. Surely you are going to like it there. Just do not forget that before you go, you must plan the vacation thoroughly. No detail should be left behind but other than that, happy tanning.